What makes a person write about a crazy subject like dieting and eating out? Not too long after The Restaurant Dieter took up with his spouse, he heard the phrase “PR” applied to restaurants. Specifically, it stood for “personal record” — how much was spent per person on expensive, high-end meals. We were at a nice restaurant with TRD Spouse’s family at the time. This was a sign of the danger to come, of course. I grew up in more modest surroundings. 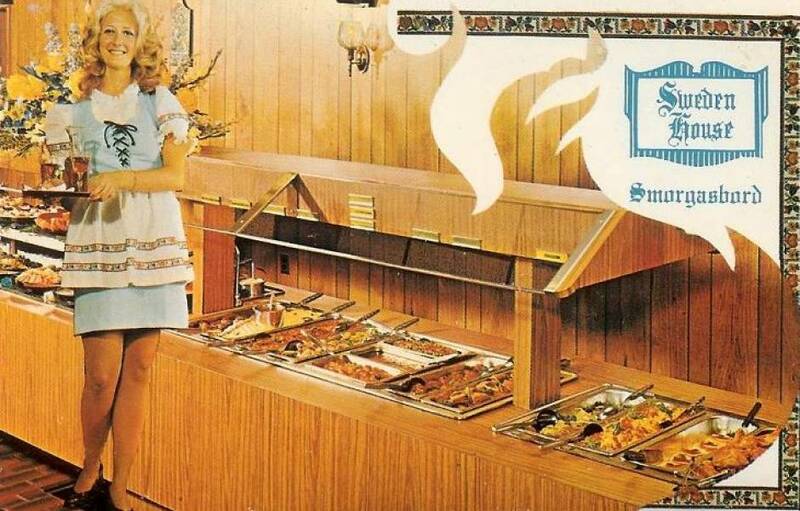 There wasn’t much point in dwelling on a PR at Symack’s restaurant in suburban Detroit. It was one of two restaurants we went to when I was growing up, and then only occasionally. Moreover, it met the criteria that rendered restaurants acceptable or not in my family: the napkins did not “stand up.” Once on a vacation with the family my mother laid down the law: A cloth napkin folded into a triangle sitting on the table was a sure sign that a restuarant was too expensive. Symack’s was all paper placemats and napkins. I do have fond memories of the food itself, though; my adult diet dilemma can’t be blamed solely on my husband. Growing up, even if we ate cheaply, we didn’t necessarily eat healthily. I craved the triple-decker Dinty Moore sandwich, whose chief sins were white bread, corned beef and Russian dressing. And the salad dressing — a big gob of Thousand Island Dressing topped with what seemed like 1/4 cup of blue cheese crumbles — still makes my mouth water. As an adult, I’ve savored it on an iceberg wedge at The Palm. The other restaurant was called the Sweden House. What was a nice Sicilian family like ours doing at a place with faux-Scandanavian overtones? Bellying up to the buffet, and I do mean bellying. It was an all-you-can eat smorgasbord, where you could — and we did — pile on the fried shrimp. Repeatedly. So I introduce you to TRD Spouse’s dining predilection with no malice. It’s certainly not his fault that I’ve battled weight nearly all my life. And even if he weren’t finding new high-end restaurants to try, I’m still occasionally guilty of finding my own smorgasbords to belly up to. Still, he provides a convenient foil in nearly all ways. A good way to think about it is that I and my family represent Toula from “My Fat Greek Wedding.” And he is Ian, so white bread he’s …Canadian. My family is securely working class, while his grandad was the chairman of the local bank. His family is The New Yorker, and mine is Life magazine. Together, we have ordered a Reuben sandwich for — 2? 3? all of Manhattan? — at The Carnegie Deli in New York. Our love of good food has led us to restaurants such as Alinea in Chicago. The link to that restaurant’s website should tell you just how swank the place is. See if you can figure out what to click on. Alinea is the creation of Grant Achatz, who is listed on the restaurant’s website as a partner on “the creative team,” otherwise known as the chef. He’s one of the nation’s high priests of molecular gastronomy, which means that the kitchen has thrown mere pots and pans out the window in favor of laboratory glass beakers and liquid nitrogen. He gets extra credit in this elite world because he has lost his sense of taste. I’m not kidding. I can’t think of a better reason for a restaurant snob like TRD Spouse to want to go there. So go there we did. There is no menu from which to choose at a restaurant like this. A meal is a symphony of chef derring-do where the menu is set in advance and only the number of courses varies. Each table must select the same meal plan, however. TRD Spouse once did the “24 course chef’s tour” with a group from work and they didn’t even have to leave Chicago. This is a restaurant where the napkins not only stand up, they also are folded, re-folded and/or replaced every time you leave the table. On our visit, a parade of servers emerged from the kitchen dispensing tiny bites of food and extensive instructions. To get the proper effect, the server advised that we need to toss back — in a single gulp — the contents of the shot glass, for inside was a celery broth and a frozen horseradish ball filled with apple juice. Maybe it was apple essence; juice sounds a little too hoi polloi. We were advised that the pillows on which one dish was set would gradually deflate, releasing the juniper scented air and imparting a lovely flavor profile (profile? which, exactly, is what?) to the food itself. No dish could simply be eaten. Of course, figuring Weight Watchers points on a meal like this is pointless. In 16 years, we’ve had a great many meals like this. One thing I’ll say for them is: the portions are tiny and while there is undoubtedly diet damage, the intense flavors are likely to come from mad scientist preparations or expensive ingredients — not the fat, salt and sugar that dominate inexpensive restaurant meals. I mean, how many calories could that juniper air have been? Now where can I go find a good friend shrimp buffet? Pay More? Why is that Even A Question?